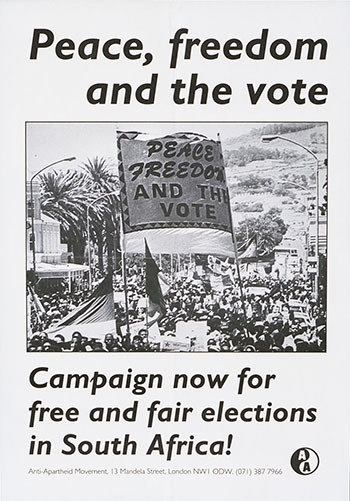 Our posters represent a variety of social, political, and cultural issues, including public health, education, liberation and independence, political campaigns, the anti-apartheid movement, Biafra, Darfur, economics, art, publishing, and music. Through these collections, scholars and students can explore how institutions and organizations communicated with African populations from the mid 19th century through the present day. In 2008 Northwestern University Library and Michigan State University Libraries were the recipients of a grant from the Council on Library and Information Resources as part of the "Cataloging Hidden Special Collections and Archives" program. Completed in 2011, this project unveiled two of the most significant poster collections held in the United States concerning issues related to the study of Africa. Over 4000 bibliographic records are now accessible worldwide via this joint portal and through both institutions individual library catalogs. If you need a digital image of the poster, image scanning services are available to faculty, staff and graduate students. The Herskovits Library or Digital Curation staff can deliver images to patrons in various file formats and resolutions for electronic presentations, printing or archiving. Learn more about this service. Note that due to copyright restrictions, images from our poster collection cannot be distributed or used commercially. Images can be used by Northwestern University students, faculty, staff and site visitors for research and scholarly purposes only.